No person shall be deprived of life intentionally except in execution of a sentence passed in a fair trial by a court of competent jurisdiction in respect of a criminal offence under the laws of Uganda and the conviction and sentence have been confirmed by the highest appellate court.Art. 22, 1995 Constitution of Uganda. This would seem to suggest that any police "shooting to kill" would be unlawful. freedom from torture and cruel, inhuman or degrading treatment or punishment, freedom from slavery, servitude, right to fair hearing, right to an order of habeas corpus. Surprisingly, though, this list does not include the right to life. The Uganda Police Force and Uganda Prisons Service are formally recognised in Uganda's Constitution,Arts. 211 and 215, respectively, 1995 Constitution of Uganda.but the use of force by these law enforcement agencies is regulated in distinct laws. 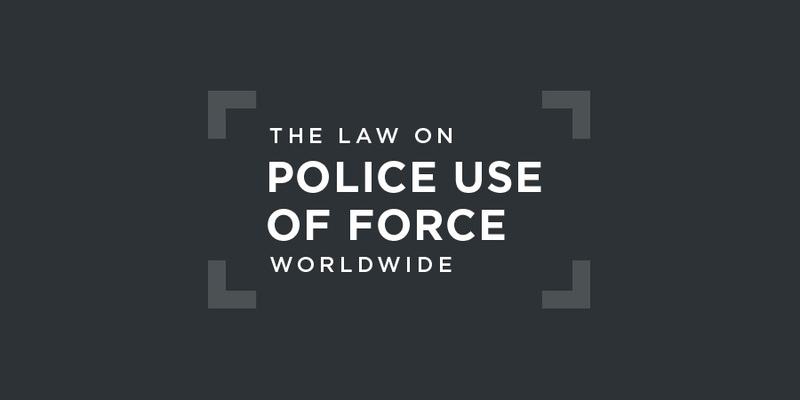 The 1950 Criminal Procedure Code addresses the use of force in effecting an arrest. This colonial-era legislation is still in force. In making an arrest the police officer or other person making it shall actually touch or confine the body of the person to be arrested, unless there be a submission to the custody by word or action. If a person forcibly resists the endeavour to arrest him or her, or attempts to evade the arrest, the police officer or other person making the arrest may use all means necessary to effect the arrest. Nothing in this section shall be deemed to justify the use of greater force than was reasonable in the particular circumstances in which it was employed or was necessary for the apprehension of the offender.S. 2, 1950 Criminal Procedure Code. The 1994 Police Act also regulates, in part, use of force by the Uganda Police Force. There is no general obligation to use only necessary and proportionate force. - a person who, through force, prevents the lawful arrest of himself or herself or of any other person.S. 28(1), 1994 Police Act. This is an extremely permissive authority that goes far beyond the confines of international law. If upon the expiration of a reasonable time after a senior police officer has ordered an assembly to disperse ... the assembly has continued in being, any police officer, or any other person acting in aid of the police officer, may do all things necessary for dispersing the persons so continuing assembled, or for apprehending them or any of them, and, if any person makes resistance, may use all such force as is reasonably necessary for overcoming that resistance, and shall not be liable in any criminal or civil proceedings for having by the use of that force caused harm or death to any person. This also does not comply with international law. (1) A prison officer may use such force against a prisoner as is reasonably necessary in order to make the prisoner obey lawful orders he or she refuses to obey or in order to maintain discipline in a prison. (b) a firearm shall not be used against a prisoner unless the prison officer has first given a warning to the prisoner that he or she is about to fire upon him or her and the warning goes unheeded. (c) engaged with others in riotous or threatening behaviour and refuses to desist when called upon. According to subsection 4, and notwithstanding subsections (2) and (3) cited above, "no prison officer shall use any weapon against a prisoner in the presence of his or her superior officer except under the orders of the superior officer." shall, as far as possible, be to disable and not to kill. According to the African Police Oversight Forum, internal accountability mechanisms of the Uganda Police Force include a code of conduct for police officials, police disciplinary courts, a police complaints system, and a human rights and complaints desk that receives complaints of police abuse and attempts to resolve these complaints, although very rarely through prosecution of offending parties. The Uganda Human Rights Commission is a constitutional body responsible for investigating complaints and initiating investigations on human rights violations.African Police Oversight Forum, An Audit of Police Oversight in Africa, 2008, p. 72. A person is entitled, without prejudice to any other legal means of redress available to him or her, to make a written complaint as to – (a) any instance of ... oppression or intimidation by a police officer.Complaint/s against a Police Officer (Police Form 105), at: http://www.upf.go.ug/complaints/. ensure that law enforcement officials are prosecuted for any disproportionate use of firearms against civilians. Additionally, it should continue its efforts to train police agents, members of the military and prison officers to scrupulously respect applicable international standards.Human Rights Committee, Concluding Observations on Uganda, UN doc., CCPR/CO/80/UGA, 4 May 2004, §16. There are, to date, no relevant judgments from the African Court on Human and Peoples' Rights concerning use of force by a Ugandan law enforcement agency. In this case, the Constitutional Court rejected allegations by two of the petitioners that they were forced, by beatings inflicted by Ugandan Police officers and military personnel, to publicly confess their participation in the July 2010 Kampala bombings. A number of allegations of ill treatment were passed on to the High Court for adjudication. Byarugaba v. UgandaByarugaba v. Uganda  1 EA 234 (CAK). In this case, a police inspector was convicted of unlawfully wounding two men who had been arrested but not charged with any offence. He shot them on the basis that they were attempting to escape from lawful custody even though they were unarmed and handcuffed. The court held that he could have easily re-arrested them without the use of such force and he was thus convicted.